Good news. Almost entirely by popular demand, at last I made it. Ok, this is a beta version for now, with minimalist user interface (yep, I love it) and still testing functionality. Google App Engine has its own pitfalls, especially on socket handling. But it looks like running good. A couple of words about how this works. First of all, you have to create your own room. Then call your friends for join the room. That's all. Throws are synchronized and everyone in the room will see them. Will be soon. I do not define a date, it matters to my own mood, muse and free time. I fixed some bugs and changed login screen to more simply form, but this is development version yet. Logs and chat will be included as I've promised. Still didn't finish through lack of time ;) But new version is close to be finished though. A surface skin and a small sound of dice clattering would be off the charts. slick app bro. Thanks for idea =) Do not know if it applicable this project though =)) Let's see. If you upload it to github, I would love to help add new features. (2) option to roll without adding multiple dice together. I know you can see the dice rolled right now, but I'd like to turn off the total. Love the program, but for an unknown reason this runs extremely slow on my system and gives me a different result a number of seconds after everyone else. How can i fix this or what is causing this? Other sites such as Netflix run smoothly without any issue or buffering screen. Unfortunately, I can't say anything concrete due to lack of details. Maybe it would be wise to show browser error messages to user... Ok, there are two possible causes: 1) your browser and video card are not able to work with webgl, 2) your browser has a network problem: it is bad with async web-calls and http long-pulling. If you tell me you browser name and version, it will be posible to move forward the issue. 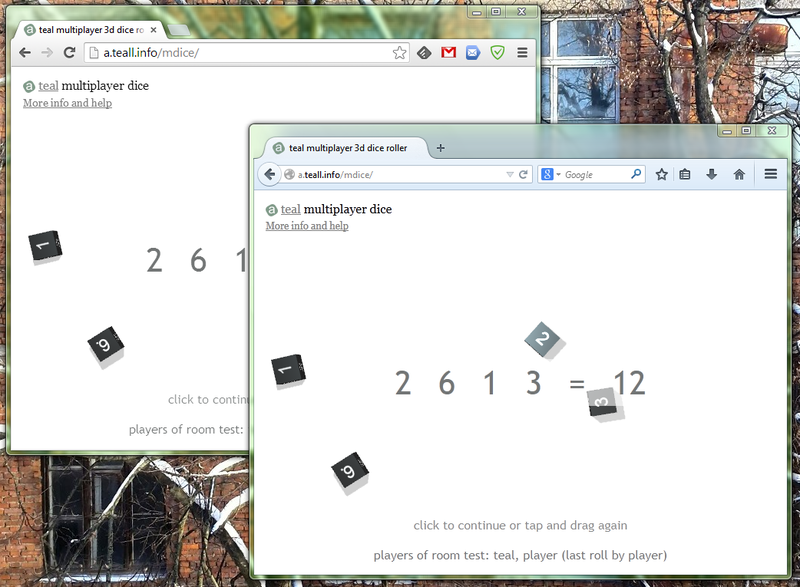 Also you'd check if single-player version (http://a.teall.info/dice) works or don't. I don't get the input box to create a room. If I choose 2d6, could you make them so you could choose a color for each? This is great! Just what I need to take care of the dice part for my online RPG. I do have one small feature request though: I'd very much like to be able to do simple math with the rolls. Writing "2d6+1" works as expected, but not "2d6-1". I'd also like to be able to do more advanced stuff, like "(2d6)/2+3", but I'd be very happy with just simple subtraction. Thanks for taking the time to make this webapp! It looks great. I think I will spend some time to improve notation. This is a thing that has to be done at last =) Subtraction is a simple task, as you said, but I'm going to add some more stuff. Let's see. Don't lose passion through I'm very busy with my job duties. But ok, I have to find some more time for this after all. I hope, I'll finish it within a week. Good luck! I must have forgotten to turn on notifications for the post, because I didn't see that you replied before now, as I'm coming back to ask about something else. Happy to hear you are willing to do the odd improvement here and there! Do it whenever inspiration strikes. I know how hard it is to find time to everything, and don't want to add to any pressure with these trifles. I came to tell you about a problem I and my roleplaying group are having: After a while, we lose the connection to the server. In fact, the whole site hangs, and our mouse cursors are turned into that swirly one. It's very strange. Reloading and even hard reloading the page doesn't make a difference. Maybe you can see something on a server log somewhere? For all I know it might be happening because of a timeout. If there is a timeout setting, could you set it to be a bit longer? Roleplaying game sessions are usually pretty long. At least three or four hours. It's unfortunate when one or two of us are suddenly unable to roll dice. It would be great if you add fate dices...Awesome work anyway. Thank you. Man, this is really awesome! Thank you very much! Anton, I love this program, but since things tend to differ from game to game, I was hoping you might have an option for d10s to be either 0-9 or 1-10. A lot of the games I play use 1-10, with the 0 on the die representing 10. Obviously, one can simply count up the number of 0s (n) and add n*10 to the displayed result to get the correct result. But I really like elegant solutions rather than band-aid fixes. All in all, it's a great program and works really well, so thank you for your time and effort on providing something like this for free for everyone to use. P.S. As luck would have it, that was actually my first roll made in the program to try it out, and it definitely seemed off to me. Thanks, Brandon. About your request, you know, you can roll like 10d10+10 to emulate 10 d10 dice with 1-10. The notation already allows this. I know I have to add more complex forms of notation, and additionally about 10 another types of die =) That's all from requests. I hope I will have a time and inspiration for this. After all I should start Kickstarter project and create universal dice roller platform. Maybe =) Anyway, thanks for you support, I very appreciate this. Is the multiplayer not functional right now? If this was a stand alone, downloadable little app it would be awesome. Add a few little features like options for exploding dice and such and you have a winner! Hell, you could sell dice skins for a few bucks just for folks that want some customization. With Google hangouts dropping it's API a lot of online RPG groups will be losing group visible dice rollers. This would fill that gap for those like me that hate chat command rollers and want something that looks and feels like real dice. Hope you push on with this and make the multiplayer available! Love this but I don't know if there is a bug or just something wonky on the back end that makes it unreliable. We haven't actually been able to use the multi-player version yet; it will allow you to create/enter a room only intermittently. Half the time it just hangs when you try to create/enter a room. You are right. Something been broken. Thanks for notice. It seems my GAE server outdated or something like this. I will check ASAP, but I can not promise it to be done fast ... Have a lot of another work, sorry. Totally understood your "day job" certainly takes priority. We've looked around and of all the different tools we've seen, we like what you've done the best. Hopefully you can figure out what is broken as we'd love to use this for our weekly gaming session. I really like this 3d dice roller and it would be nice to have it as an open source project, I understand you haven't been working on it for a while, any plans to publish it anytime soon? The server end uses part of my private code, so I'd do not like to share it. If you want to collaborate, you can write me email and we can discuss it. I'm very sorry if this disappointed you. I have already implemented multiplayer version in several commercial (and non-commercial) projects, so if you describe me your thoughts we can made an agreement. Note, that singleplayer version is free to use without any terms. Thanks for making this, it is awesome, just what I am looking for in a shared dice roller with others online! Thank you! Steve, thanks to your "nooo!" I decided to go and check what's wrong with mdice =) Ok, it seems to be working right now. I do not know what it was exactly... It wasn't working, then I re-enable debugger and boom, now it works. Something like a bug in GAE I guess. Anyway, it may turns unworkable again because of quotas. If it will, say me, I do "GAE quotas" payment. Thank you very much indeed Anton! It's working now, yay :D !! Hi Anton - my 30 yr once-a-month DND group have been using your multiplayer version for our remote gaming sessions (along with http://zoom.us ; herolab and 3dvtt). As others have mentioned, I would pay a reasonable price for a standalone multiplayer app version. Yesterday I had an issue with the multiplayer mode, I was able to create a room but my friends couldn't join it. The couldn't pass the loading screen. I would totally pay for the app when it is released! An Idea for you. I have been using the RPG sound mixer, but unfortunately it was decomissioned, and now I do not have an alternative. Below is the software for better comprehension. There doesn't seem to be a way to create a room for the multiplayer mode, and if you try to join or put anything into the join room fields it just freezes when you click enter. is there a way to add modifiers to the rolls? I recently discovered this and was excited to use it but we can't see any options for password locking rooms, and whenever i try to host one the webpage just freezes with a buffering symbol! How did i fix this ? First of all: Great work! 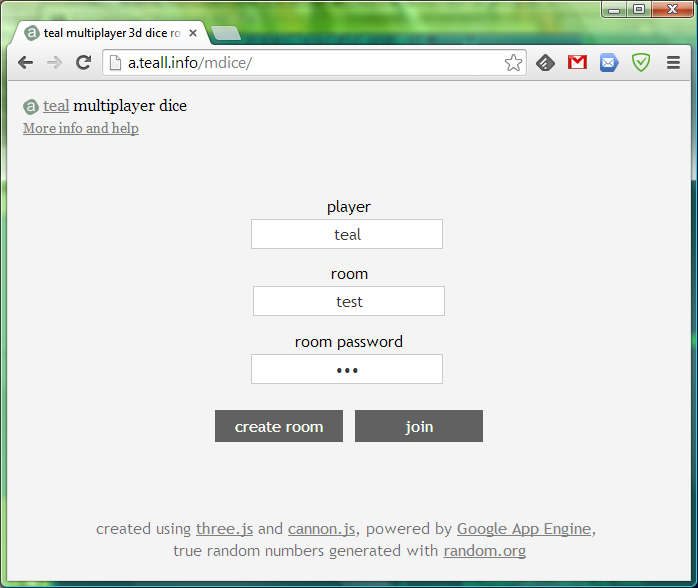 I would like to integrate the multiplayer version of your dice roller into my planned own (currently none-commercial) application. Could we discuss the terms via email? Thx in advance and I wish you a nice weekend! I can't create a room either. :( Can I fix this? I am a user from Mexico who enjoyed your page with some friends, since the day that the Multiplayer began to fail we are broken because each one is from a different state, hopefully you can fix the multiplayer. We users will wait for your arrival as our savior. I am not seeing an option to create a room just to join a room, asking for name and room number...is there a link for creating a room or is that part sill a WIP? It seems like it is not letting me create a room. The page just locks up. Hey, did you ever add the thing with the chromakey background, remove shadows, saturation and inverted dice colors? Very greenish and without any text. Hope you will like it. While I don't doubt I could be mental disabled on this, I can't create a room currently? For some reason, there is no button to create a room. Multiplayer doesn't work to me also, it frezez and that's all. Using it on Chrome. What to do? No way to use multiplayer again. This app inaccurately calculates a d10 dice throw. The 0 on the dice actually represents 10. Aside from this minor defect, this is an incredibly useful app. Please fix it to make it even better. I see it works now! This is amazing. I am writing a game currently that doesn't use modifiers for roles just different dice to denote skill level, and this is perfect. How can we market this together?! I've learned a lot just reading your source code and I was wondering if it's okay with if I use some of your code in my project. I'll credit you of course. Hi! Sure, you can use my code, it's free =) Good luck!